This is a remarkable story. Their Pope (Coptic Church) has recently passed away and the Muslim Brotherhood is now in charge of their nation with the persecution of Christians on the rise nearly on every front. 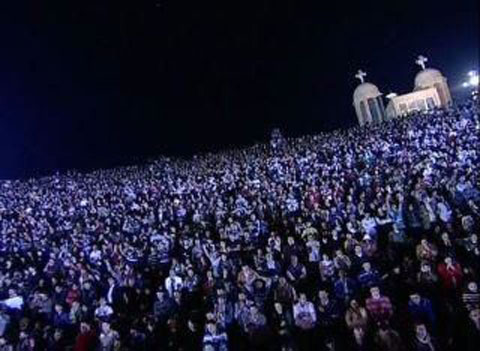 In the midst of all of the current turmoil including the attacks upon the American embassy in Cairo, over 10,000 young Egyptians gathered in the desert to pray for their nation and worship Jesus. Earlier this month about 10,000 Christian young people came from all across Egypt for three days to worship the Lord and to seek God’s blessing for their country. The worshippers, mostly ranging from ages 13 to 30, gathered from 10 a.m. until 8 p.m. each evening. Many traveled hundreds of miles to the worship site in the middle of the desert north of Cairo. "To sit among over 10,000 young people, worship with them in a roaring holy noise, listen to powerful and challenging messages and pray for God’s powerful presence in our lives; really, it is hard to describe in words," says a Christian leader. "Sitting at the very back of the small soccer stadium gave me a good view of the scene. Thousands were sitting to my right, thousands to my left and thousands more in the middle. Hardly any empty gaps! According to the article, another 2 million followed the event on Internet and through live satellite transmission. Most of the time ‘bad news’ is coming out of Egypt, for once here’s a sovereign work of God. 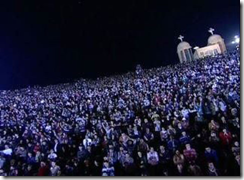 – 71,000 attended the all-night prayer meeting in Cairo. – It was held at the cave church on Cairo’s largest garbage city, Mokattam. 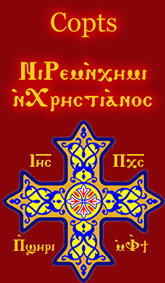 This church is called St Simeon the Tanner Coptic Orthodox Church. – The gospel was proclaimed during the Prayer event and some people responded to the challenge call to follow Jesus. – Prayers for healing were made at midnight and some people were healed of physical problems. "I saw signs of the beginning of revival that I have never seen before!" Also while you are at it, read some of the other stories of Andrew’s visit in Egypt. They are eye opening and heart warming to say the least. Response: It was remarkable on a number of different levels. Folks being healed and coming to Christ plus a real unity displayed in the Christian community. Also read Andrew’s report of prophetic words coming to the Christian leaders there. Obviously the Holy Spirit is at work awakening all of the Christians in Egypt including the Coptic Church. Amazing. Note how in the report the Evangelical pastor was seemingly slighted at the prayer event but continued anyway in support and unity with his fellow Coptic Christians. What a great example for all of us. The Christians in Egypt have been constantly under pressure and attack from the radical Islamists since the storied beginning of the so-called ‘Arab Spring’ which the Western media has cast as a push towards Western-style democracy.